And choice–this point is emphasized–is what it’s about: This is a book for those who have a choice. Poverty and isolation are examples of two limiting factors that can leave consumers with little or no choice in what they eat; people living with these constraints “cannot reasonably be held morally accountable in the same way as those who…choose to be either an omnivore or a vegan” (3). 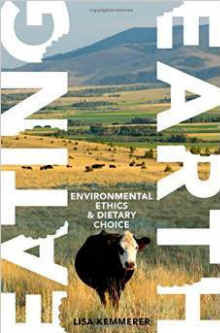 While animal rights is certainly given its due, the focus here is on the environment vis-a-vis what we eat: “(I)f you care about the health of this planet or the future of humanity, and if you have access to a variety of affordable food alternatives, this book is for you” (4). Is she talking to you? The book’s simple three-part structure features sections on farming, fishing, and hunting. Footnotes are kept to a minimum. Each of the three sections ends with a list of sources cited. Pages of text are generously broken-up with illustrations, charts, and PowerPoint-type summary slides. All of this makes what could otherwise be a mind-numbing reading experience compelling, accessible, and easily-digested. Lisa holds a B.A. in international studies, Reed College; M.T.S. in comparative religions, Harvard University School; Ph.D. in philosophy, University of Glasgow, Scotland. She is a philosopher-activist, artist, and lover of wild places, who has hiked, biked, kayaked, backpacked, and traveled widely. She is the author and editor of several books, and is currently associate professor of philosophy and religion at Montana State University, Billings. For more, visit her website here.